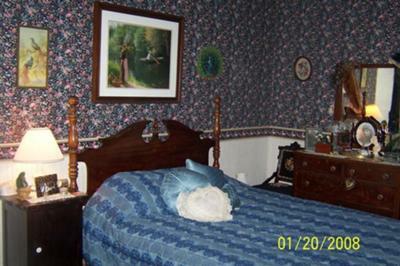 Peacock Room, most haunted room! 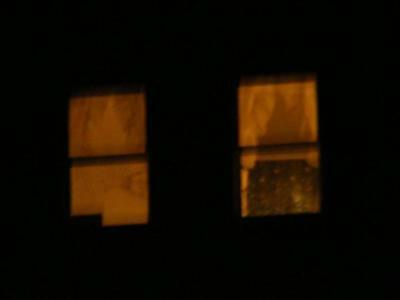 3rd Floor Ghost in the window, pic taken by guest! Sweet Dreams Inn B&B at night, creepy! Haunted 1890 Victorian B&B in Bay Port, Michigan. The Wallace family still resides here as they did in the late 1800's thru early 1900's. They walk the halls & pace the Peacock Room daily. Open & close doors, turn lights off & on, turn up the HEAT! Also, go up & down the stairs, move things, talk, cry, giggle, move furniture, push you, touch guests, etc. We also are in 4 haunted books regarding many of our guests stories. Soon to be in another book that the innkeeper is writing on her guests, family & friends stories of what really goes on here with these spirits! Also, soon to be in 2 upcoming movies! Res. call 586-322-6170. open year round. Ghost hunts with guests with SE Michigan Paranormal Society, 10-12 guests per hunt, must spend the night, call for costs & details. Very, very active. Call if you don't scare easily, NO REFUNDS, NO EXCEPTIONS! Many leave in the middle of the night!!!! Ghosts in the window on the 3rd floor sometimes show themselves so that you can get a pic!